Thoughts & musings about flowers, photography, weddings and people. Back in October of 2014, I received an email from across the world from a bride who wanted to elope in New York the following summer. Her name is Sarah. His, Nick. Sarah works for Etsy and is a fellow avid floral lover and Nick has a real love for bikes. They were to be traveling from Australia, getting hitched in NYC and continuing a honeymoon with a bit of time here and the rest on the west coast. 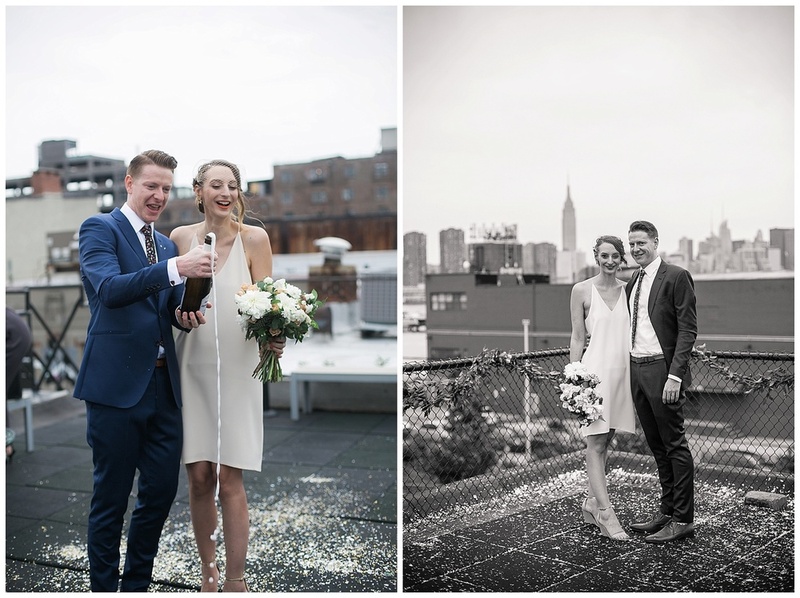 She wanted a lush bouquet for herself and a green garland for the ceremony area - a small rooftop in Greenpoint, with Manhattan as the backdrop. I was happy to oblige. Aside from her lovely disposition and simple, but very tasteful requests for her florals, I get over the top excited when I hear of elopements. I think it's ABSOLUTELY the most romantic way to get married. Cut to their actual elopement in June. Some of their closest family and friends found out about their plans and immediately made their plans to join them. So on June 17th, there they were...in a place that was unfamiliar to them but surrounded by familiar people who loved them, getting married to each other in such a simple, yet beautiful and significant way. I think their elopement was damn near perfect, if not actually so. And not only that - Sarah, Nick and I became fast friends, taking trips to the flower market and seeing fireworks on a roof over Fourth of July together. Sarah told me that I made a few of her dreams come true during her time in NYC. I'm just happy to be a part of this dreamy time in their lives. Come back to NYC soon, you beautiful people! I miss you, really.